The GripSense's sensor is inside the rear half inch of the housing, which goes over the trigger guard. It senses your finger when you grab the pistol in a firing grip and turns the unit on. The CenterFire is a new combination light/laser unit for compact handguns from LaserMax (lasermax.com), but the real news to me isn't the unit itself, but LaserMax's new GripSense activation technology, first available on this model. Previously, to activate a light or laser, the shooter had to do something after grabbing the gunâ€”hit a button or squeeze a pressure switch. The only near-exception to this that I know of is the Viridian "instant on," where the pistol-mounted unit is turned on, then when the pistol is holstered in Viridian's special holster it shuts off until it is drawn. But the Viridian unit doesn't just require a holster, it requires that company's holster. What if you wanted that kind of automatic activation without using a holster? Enter the LaserMax GripSense. The same kind of technology that allows the screen of your smartphone to detect your fingertip can be found in the new CenterFire light/laser. Specifically, it is a capacitive sensor, but according to LaserMax's vice president of marketing, Jay Duncan, the firm's engineers refined and ruggedized the technology for use on a firearm. The unit clamps over the trigger guard. There is an unseen sensor inside the unit at the rear of the polymer housing, right where your middle finger rests when you have a firing grip. As soon as you get a grip on the gun, even a loose grip, the light and laser activate. Unlike laser/light units with pressure switches, you do not have to exert extra pressure on the gun. A lot of experts don't like pressureswitches on handguns because squeezing them can trigger a sympathetic response in your trigger finger. Again, this unit requires no pressure, just the lightest touch. There is also a manual activation button on either side of the unit if you decide you would rather use it instead of the GripSense. The CenterFire features a 100-lumen mint green LED light and 5mW laser, and the unit is programmable with seven modes. Units are available with either red or green lasers. I got a red laser model for testing. To my eyes, the "mint green" flashlight beam is as much yellow as green. So why did LaserMax go with a lemon/lime flashlight beam color instead of pure white? Green is the most vibrant color in the color spectrum, and the human eye is drawn to it. Many soldiers and cops use red lens flashlights to read maps or do other detail work at night because red light doesn't ruin your night vision. Green is actually at the opposite end of the color spectrum from red, which is why it works so well. And remember, the flashlight puts out 100 lumens of illumination, and lumens are a measure of brightness independent of color. I've found 100 lumens to be bright enough to identify objects in people's hands out to 10 yards, but before you start using your weapon light to assess and identify threats, remember that if you're shining a weapon light at someone, you're pointing a loaded gun at them. The flashlight throws a wide cone of light. At a distance of six feet the circle of light is about six feet wide. The flashlight beam is round and even, with the center third being slightly brighter but with no sharp edges. The CenterFire isn't just an always-on light/laser combo. You can program it for light only, laser only or both. The LED light can be adjusted from the full 100 lumens down to fourâ€”although I'm not sure why you'd want to do that. Still, I suppose it's nice to have the option to tailor the light to your tastes. The laser is also programmable for either steady on or pulsing. Why pulsing? A pulsing dot draws your eye more quickly than a steady dot. I mounted a CenterFire unit on my Smith & Wesson Shield to test it out. I was most concerned with accidental activation during pocket or IWB carry. I was not able to get the unit to activate accidentally no matter how hard I pressed the side of the pistol against my body. It required flesh pressed directly against the underside of the trigger guard in the right spot. The unit comes with two 1/3N batteries, and battery life is advertised as more than five hours of continuous use. You don't have to remove the unit to change the batteries. LaserMax says this unit works when wearing gloves, but my testing showed it depends on the type of gloves. With thin knit gloves, it worked with no problems. With thick leather work gloves, it didn't work at all. 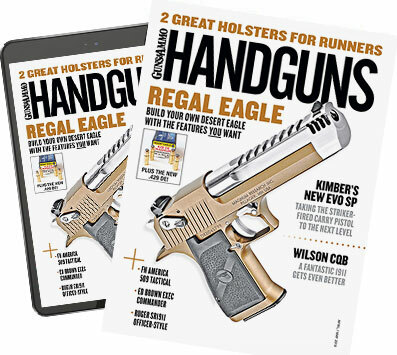 When in doubt, see if you can work your smartphone wearing your gloves of choice, and if the screen doesn't register your finger, the CenterFire probably won't either because it uses the same basic technology. Right now the LaserMax CenterFire is available for several popular concealed-carry pistols, including the Ruger LC series and the Smith & Wesson M&P Shield. Models for the Glock 42 and 43 are on the way, with more sure to come. Prices start at $199 for the red laser models; the green laser models cost an extra $20.